They might have to rethink things the next time there’s a double-header at the Air Canada Centre. That was the case on Tuesday, with Raptors 905 hosting the Rio Grande Valley Vipers for an 11 a.m. tip-off and the Toronto Raptors hosting the Phoenix Suns in the nightcap. McKinnie and Brown appeared in both games, joining Bruno Caboclo, Fred VanVleet, Pascal Siakam, and Jakob Poeltl as players to do the 905-Raptors back-to-back in the same day. 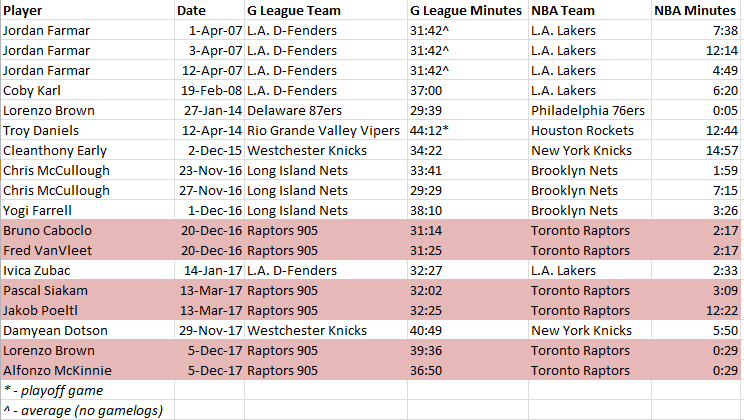 Raptors now make up six of the 18 times in G League history that a player has done a doubleheader, and employ six of the 14 players to have done so. Late in the third quarter, it looked as if McKinnie and Brown could be in for significant fourth-quarter run. The Suns staged a comeback that the Raptors’ rotation players needed a few extra minutes to fight off, and so the 905 duo only wound up playing 29 seconds. McKinnie had even begun unbuttoning his pants at one point, ready for adrenaline to help raise his energy level for a second game of the day. Even with just a brief cameo, the effects of the doubleheader were being felt after the game. The first leg of the twin-bill was easy. Raptors 905 broke their own G League record with a sold-out crowd of 18,900. More than 300 buses from more than 100 schools brought in loads of children for the franchise’s second of three school-day games this season, allowing the 905 to one-up the 18,090 they packed in for a March 13 day game against the Austin Spurs last season. Fuelled by an incredibly loud atmosphere, Brown notched a 36-point triple-double and McKinnie scored 23 points with 16 rebounds. “Oh, it’s very cool. I think you come here, have a good crowd, they give a lot of energy for us,” said Caboclo, who also suited up for the 905. The 905 came up short, losing 117-109 to the streaking Vipers, but it was one of their best offensive performances of the young season. Head coach Jerry Stackhouse is pleased with the progress the team is making, and he’s already circled the next Air Canada Centre game (Feb. 25, 5 p.m. vs. Wisconsin Herd) on his mental calendar. Before they could look ahead to the next 905 game at the ACC, McKinnie and Brown had to worry about their next game at the ACC that same day. There were teammates warning McKinnie ahead of time what a challenge two games in one day would be. It’s something most players haven’t done since AAU ball, if they can recall when they last did it at all, and it’s difficult to prepare for, even if minutes might be scarce. Players in a position where they’re seeing time in the G League have to be ready to pounce on every NBA opportunity, so there’s an urgency to fight off any fatigue or lethargy. Brown had the slight benefit of having been through this before. In 2013-14, Brown played 30 minutes with the Delaware 87ers during the day before getting the call up with the Philadelphia 76ers, appearing at the very end of that game, too. He’s now one of just three players (Jordan Farmar and Chris McCullough are the others) to have played in multiple doubleheaders. Neither McKinnie nor Brown are planning to grab a nap between games if there’s a next time around. Brown is fervently anti-nap, and McKinnie’s between-game routine Tuesday (buying new Js at Eaton Centre) suited him just fine. Still, the day had them looking forward to a good meal and what promised to be a good night’s sleep.